For most people when they hear the words “fall” and “pumpkin” the default idea that pops up seems to be pumpkin pie. Me, not so much. 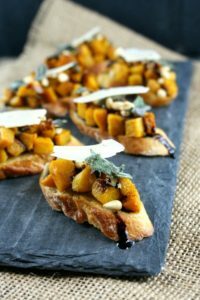 I am soooooo not a fan of the pie but savory pumpkin recipes, yes please. I am all about doing fresh. Yes, using the canned stuff is ok in a fix but, know this, most of what you think is pumpkin in the can is not always just pumpkin. Seriously??? So what exactly is in that canned called pumpkin puree? Well, its pumpkin and/or squash. 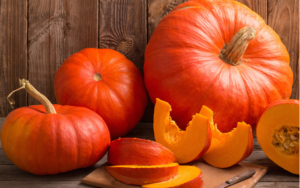 If you like, you can eat every part of a pumpkin, skin, leaves, flowers, pulp and of course the seeds. The first time word “pumpkin” showed up in literature was in the fairy tale Cinderella. Pumpkins are actually a fruit. Preheat oven to 350. Heat the oil in a pan and sauté the onions. Cook for 2 minutes then add the honey. Mix to combine and then cook, stirring occasionally for 10 to 15 minutes until the onions are soft and lightly golden. Reduce the heat, add the wine, mix to combine and cover. Cook for an additional 20 to 30 minutes (remove the lid and stir at the 10 and 20 minutes) until the color of the onions becomes a deep golden. Remove lid, remove from heat, remove lid and cool for 30 minutes. Preheat oven to 350. In a bowl combine the pumpkin or squash, olive oil and salt and pepper. Toss to coat and then roast the pumpkin on a cookie for 25 to 35 minutes until softened. Grease a 9 or 10 inch spring form pan with olive oil. Place a sheet of phyllo pastry with into the bottom of the pan with the edges hanging over the side of the pan. Lightly grease the sheet and place another sheet on top slightly angled so that the sheets and sides are covered all around the sides. Repeat until all the sheets are gone. In a bowl combine the onions, pumpkin, eggs, milk, cheese and sage. Mix gently to combine and spoon the mixture it into the crust. Roll the overlapping edges of the filo dough to form a crust. Bake 30 to 40 minutes until golden brown and set in the center, Serves 6 to 8. Preheat oven 350. Brush each slice of bread with olive oil on each side. Lightly sprinkle salt. Preheat oven to 350 degrees. Lay all sliced on a cookie sheet. Cook for about 10 minutes or until light golden brown. Set aside to cool. Arrange cubes of pumpkin onto a cookie sheet with sides. Drizzle olive oil over the top and sprinkle with salt and pepper. Mix to coat. Roast for about 30 to 35 minutes or until the pieces are soft. Remove and let cool. In a sauce pan, add the balsamic vinegar and cook on medium until it reduces and becomes a thicken consistency similar to maple syrup. Preheat the oven to 375. Grease a 9×13 baking dish. In a sauce pan saute the onion in 2 tablespoons of butter. When soft add in the flour. Mix to combine and cook, stirring for about 2 minutes. Slowly add the half and half cooking while whisking. Simmer and whisk for 2 to 3 minutes. Whisk in the cheddar cheese and cottage cheese and whisk until the cheddar cheese melts 4 to 5 minutes. Add the pumpkin puree, salt, black pepper, garlic powder, paprika, nutmeg, and hot sauce (if using) and whisk to combine. Remove from heat and add the fake crab and pasta. Mix to combine. Pour the pasta mixture into greased pan and sprinkle the panko crumbs and Parmesan cheese on top. 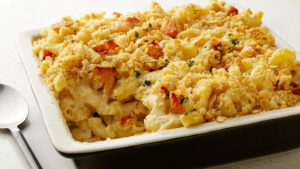 Drizzle 2 tablespoons of melted butter over the top and bake 30 to 40 minutes until bubbly and golden on top. Serves 6 to 8.